WASHINGTON, D.C. -- President Obama yesterday announced that the interrogation and permanent detention of suspected terrorists at Guantanamo Bay, Cuba, is "totally copacetic" with the Geneva Conventions. "This is a remarkable achievement," the president told a press conference Friday. "A mere four weeks ago, Guantanamo Bay was a human-rights catastrophe such as the modern world had never seen. Yet today, through the power of Hope, we have succeeded in making this facility a shining examplar of freedom, a beacon of Change admired throughout the world." The amazing transformation, Obama told reporters, would not have been possible without the "tireless labors" of the staff of the newly-created federal Department of Unicorns and Rainbows. . . .
His speech was written by the Dept of Newspeak and Minitrue. Very nicely done. 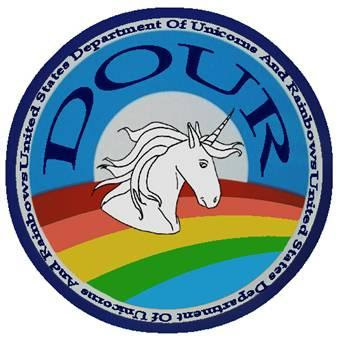 As an acronym fetishist, the fact that "dour" is the opposite mood you would expect to result from the the workings of the Department Of Unicorns and Rainbows has a special beauty to it. Not unlike the counter-intuitive results of centralized planning trashing the Rule of Law, as explored by Hayek in chapter six of "The Road to Serfdom". Just enjoyed that chapter this morning. One wishes that Young4Eyes and his ilk would take in a bit of Hayek.